There are so many things to do in Margate! And Margate attractions include something for everyone. Culture mingles with the seaside. History goes hand in hand with modernity. Quirky cafes meet award-winning cuisine. Whether it’s traditional seaside fun you want. Or if you’re looking for other things to do in Margate it’s all here! Even a sunnier and drier climate than almost anywhere else in the UK! And there are lots of things to do near Margate too! Margate has attracted visitors and holidaymakers for over 250 years. In the late 18th and early 19th centuries wealthier Londoners arrived by sea to “take the air”. As the industrial revolution progressed the railways meant everyone could come. The introduction of days off for working people ensured the growth of things to do in Margate. Many continued to arrive by paddle steamer along the Thames Estuary. Nowadays, of course, it’s even easier to get to Margate. It takes around 40 minutes by car from Yorke Lodge. Or a regular train service from Canterbury West takes as little as 30 minutes. The station is a 12 minute walk from our bed and breakfast. This classic funfair was probably the first of the main Margate attractions. There has been a funfair on the Dreamland site since 1880. In 1920 it became Dreamland. This was when the scenic railway rollercoaster opened, but more about that later! Dreamland today is a vibrant mix of adventure, fun, music, food & drink and culture. With vintage rides, amusements, children’s activities and street food what more could you want? They even have their own music festivals! Dreamland is on Marine Terrace CT9 1XJ and near to Margate Station. The scenic railway is a wooden rollercoaster. And it’s one of the most exciting things to do in Margate! It opened in 1920 and is the oldest rollercoaster in the UK. It’s also one of only eight scenic railways in the world. As it’s Grade II* listed it can’t be demolished. But don’t let its age and uniqueness put you off! It’s as thrilling as any modern equivalent. Take a ride and imagine how visitors nearly a century ago must have felt! As Margate attractions go it’s still pretty unique! From the very old things to do in Margate to the very new. The Turner Contemporary opened in April 2011 and is the South-East’s major art gallery. Built on Margate seafront it occupies the site where JMW Turner stayed whilst in Margate. This ultra modern building houses an eclectic collection of modern art. Although at least one Turner is always on show. From Turner himself to Tracey Emin Margate has eminent links with art. Opposite the Turner Contemporary, Margate Harbour Arm extends out to sea. Thereby offering different views of things to do in Margate. In one direction is Margate town spread out before you. In the other Margate Main Sands and oceans of sea! Stroll along the Harbour Arm to the lighthouse enjoying the bars and cafes on the way. Or drop into Margate Harbour Arm’s very own gallery. If you’re feeling energetic you can even hire a bicycle! There is pay and display on site parking. Margate Main Sands is a huge clean and very sandy beach! 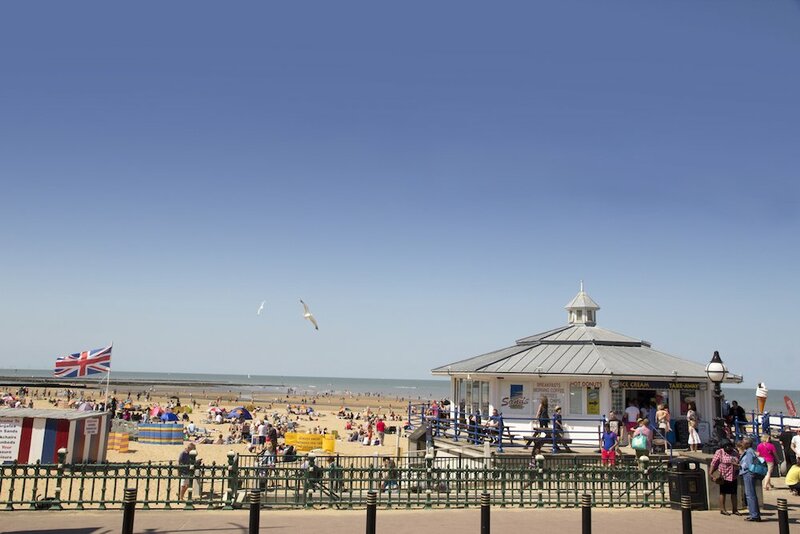 But if you’re looking for things to do near Margate there are lots of other sandy beaches nearby! Well, they’re bays really. Loads of them and too numerous to mention! Bays abound from Minnis Bay near Birchington to Pegwell Bay south of Ramsgate! There’s lots of sea to see and bays to enjoy! Pegwell Bay, by the way, is where the Vikings first landed in Kent. And there’s a replica Viking ship there to prove it! 6. For Things to do Near Margate Brave The Viking Coastal Trail! Another way to experience the many bays is from above. The Viking Coastal Trail is a 25 mile circuit. It’s used for both hiking and cycling. It’s Regional Route 15 of the national cycle network. It begins and ends at Reculver, the site of a Roman fort. Heading East from Reculver it hugs the coast line via Margate, Broadstairs and Ramsgate before turning inland. The coastal part is mostly traffic free. The inland part, however, is less so. But improvements are being made to help this. This is just one of many cycling and hiking routes to explore near Margate. The Margate Shell Grotto was discovered in 1835. It was opened to the public in 1838 and is now a Grade I listed building. A 21 metre winding passage leads to a largish chamber. The walls and roof are almost completely covered with 4.6 million shells (who counted them?)! Nobody knows how the Grotto came to be there or why it was built. But it’s well worth a visit! There’s a modern museum, gift shop and cafe attached to the Grotto. Margate old town is a veritable cornucopia of things to do in Margate! Explore the cobbled streets where artists mingle with antiques dealers. Have coffee or a snack in one of several quirky eateries. Or for a gourmet experience there are restaurants offering award winning cuisine. The Turner Contemporary forms part of this area. Enjoy a time traveller’s guide of historical things to do in Margate. Within the heart of Margate Old Town is Margate Museum. It is housed in what was once Margate’s Victorian police station and magistrates court. The building is now Grade II listed. Over 5,500 years of Margate history is on display. Including the history of Margate police. It also traces the growth of Margate from small coastal village to major seaside resort. Not far from Margate Museum is Tudor House. Built in 1525 it is one of the oldest buildings in Margate. Tudor House is a “transitional house” spanning medieval and early modern house building. No longer a medieval hall house with vaulted ceilings. Rather an innovative Tudor building ranged over two storeys throughout. It has glazed windows, ornate decoration and two chimneys. Thus indicating that it was home to a wealthy family. Further information and opening times are available on the Margate Museum website as above. There are a great many things to see near Margate at Quex Park in Birchington-on-Sea. Still a family home there has been a house at Quex since the early 1400s. The Powell-Cotton Museum is housed here. There is a diverse collection of African and Asian natural history. The collection also includes antique furniture, ceramics, fine art and much more. The house and extensive gardens are also open to the public. When looking for things to do near Margate check out this amazing museum. The museum is a must see for wartime aviation buffs. Or anyone, really! The history of Manston Airfield goes back to the First World War. When aircraft were first used in wartime. Coming right through the Cold War and beyond. Until 1999 when the RAF left. Today there are still some cargo and civilian flights. There is a cafe and gift shop on site. 13. Care For a Round or Two of Mini-Golf Near Margate? More things to do near Margate include mini-golf! Stokes Adventure Golf is an 18 hole mini-golf course west of Margate. With stunning views across Westbrook Bay. It has even hosted the British International Open no less than four times! Further round the coast at Broadstairs is Lillyputt Mini-Golf, suitable for children of all ages. This is a 4 mile inland walk between Margate and Broadstairs. It starts in Margate at the Turner Contemporary. It then largely follows an ancient footpath. There is much to see on this walk. including Drapers Windmill built in 1845. This is now a Grade II listed building. And Crampton Tower. Here there is a museum celebrating the life of Victorian engineer, Thomas Crampton. The walk ends in Broadstairs at the Dickens House Museum. A fun and informative leaflet and map can be downloaded from: Turner and Dickens Walk. The map includes several sites to visit en route. Also things to do in Margate and Broadstairs. Should you choose not to take a map look out for “T&D” signposts along the way! Among the Margate attractions is the Jubilee Clock Tower. Located on Marine Drive it was built in 1887. This was Margate’s commemoration for Queen Victoria’s Golden Jubilee. It is of particular note because of its Time Ball mechanism. The Time Ball is raised each day just before 1pm. It is then dropped at precisely 1pm. It fell into disrepair for many years as time-telling technology improved. But in 2014 the Jubilee Clock Tower was restored to its former glory and precision. For theatrical things to do in Margate there are no less than three theatres! Margate has a long history of theatre beginning in the 18th Century. The Theatre Royal Margate was built in 1787. It is the second oldest theatre in the country. It sits within a conversation area in the centre of Margate. The building is Grade II listed. As well as theatrical productions, the theatre holds Heritage Open Days. These include backstage tours. 6th September – The Handlebards – A Midsummer Night’s Dream or “charmingly chaotic bicycle powered Shakespeare”! The Winter Gardens Margate, meanwhile, is on the seafront. For over 100 years it has attracted the best in entertainment. From music hall to musicals. The Beatles to the Kaiser Chiefs. Jim Davidson to Jimmy Carr. They’ve all played here! There really is something for everyone. The programme for September is no exception. The Tom Thumb Theatre Margate. From the very old to the very small! The Tom Thumb Theatre is one of the smallest theatres in the world! It’s quirky and family run. Originally a Victorian coach house, it became a theatre in 1984. It’s hard to miss! From the outside it looks like a Japanese- Alpine chalet! While inside red velvet seats and flocked wallpaper enhance the theatrical experience. Every Monday there is a “weekly night of off-beat cinema, wayward sounds and frequent surprises. From Bluegrass to Blue Velvet: New-Wave to No-Wave via a smattering of noir”. This is only a taste of the many Margate attractions. But it’s impossible to include all the things to do in Margate here! Not to mention what’s on in Margate! As well as the many, many things to do near Margate. For lots more information, Visit Thanet website is a good source.